Share the post "SEBS Students Transforming Blighted Housing into Valued Community Environmental Amenities"
Home purchased with Blue Acres funding that will be the study site for the Landscape Architecture Deconstruction and Restoration Studio Class. Photo by Pat Rector. Assistant professor Tobiah Horton is providing Rutgers landscape architecture students in his Design/Build studio a unique opportunity in the Spring 2017 semester. The class is “Transforming Blighted Housing into Valued Community Environmental Amenities”. Often when a flood-damaged residence is purchased with Blue Acres funding, the municipality is uncertain what to do with the property; resulting in the removal of the structure and a turf lawn requiring maintenance. This does little to add to the true value of the community or to the potential flood mitigation. 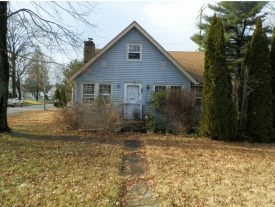 In Parsippany, Blue Acres funding has been used to purchase homes in the Lake Hiawatha section of the town. The Blue Acres Program is a component of the Green Acres Program within the New Jersey Department of Environmental Protection (NJDEP). Since Superstorm Sandy, NJDEP’s Superstorm Sandy’ s Blue Acres Buyout Program will spend $300 million to provide homeowners the option to sell Sandy-damaged or homes damaged in previous storms. In Parsippany, Hurricane Irene dropped seven inches of rain and some residents had to be rescued with rowboats. The Lake Hiawatha section of Parsippany was especially hard hit. One such residence will be the project site for this innovative class that will bring Rutgers students, faculty, and community together for deconstruction, salvage, rebuild, green infrastructure and restoration. The Landscape Architecture Design/Build studio will guide the transformation of a vacant house and lot into a park featuring green infrastructure, habitat restoration and community amenities. The studio will demonstrate deconstruction practices, led by a professional deconstruction specialist, showing that taking apart structures for reuse and increase recycling can be preferable to landfilling demolition wastes. Material salvaged in deconstruction will be used to build stormwater management features such as rain gardens, bioswales and planters–and potentially educational signage and access structures, community amenities such as raised beds, seating, fencing, paths, and walls. Choice of features and their design will be a collaborative process between Rutgers Landscape Architecture students and community/administration. It is proposed that the cleared site manage stormwater on the upland site and feature habitat restoration on the riparian (or flood-prone) edge. Green infrastructure and restoration would meet on the site in a beautiful garden park that would serve as a model of practice and a valued community meeting place. Future maintenance burdens will be coordinated between Rutgers Cooperative Extension and community partners, ensuring that the project continues as a cared-for community space.